Gluten free. Less than 3% fat. Succulent British pork with nutmeg, pepper, sage & marjoram.We know you value tradition, and when it comes to a truly tasty British favourite we know you want the best. Our artisan sausages are prepared in small batches and made with prime pork from British pigs. 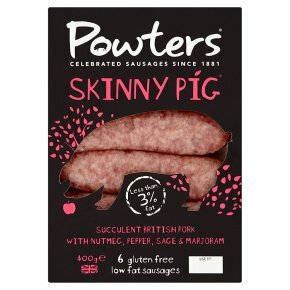 With less than 3% fat and only 97 calories per sausage, they deliver a wonderful meaty taste, infused with pepper, nutmeg and the lovely aromatic notes of English sage & marjoram. Healthy living meets hearty flavour! Moderate preheated grill for 15-20 minutes, turn ocassionally. Lightly oil coted pan, low heat for 20-30 minutes, turning frequently.